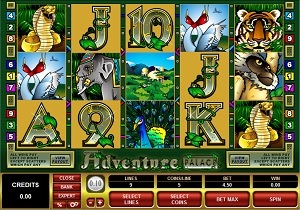 Adventure Palace is an online video slot machine game released in June 2008. It is offered exclusively at online casinos powered by Microgaming. This video slot game has 5 reels and 9 pay lines. The theme of Adventure Palace is inspired by the natural beauty of the tropical jungles and rainforests as well as some of the rarest species of animals in India. Did you know that 20% of the entire country of India is covered by jungles and forests which play an important role in the country’s ecological balance and food diversity? This is one good reason why a lot of tourists visit the country, because India is home to beautiful animals such as elephants, peacocks, monkeys, king cobras, swans and the Bengal tigers, which is actually one of the world’s endangered species. You will encounter all of these and more when you play the Adventure Palace online slot game, and you don’t even have to leave your desk! Microgaming online slot games are available to players in 2 formats – download and no-download. Whether you like to download their software first or you prefer to play instantly without the need to download, then Microgaming surely has online slot machine games to accommodate your every slot gaming preference. Good thing that Adventure Palace is available for instant play, so you do not have to download anything to find out if this game interests you in a way that you would like to spend some real money on it. Adventure Palace is created for those with adventurous souls and the desire to win some real money while enjoying a round of spins in this slot game. Most online slot players even refer to their game play as a very enjoyable adventure, especially when they took the chance at gambling their winnings. The Adventure Palace online video slot game features scatter wins, a Wild multiplier symbol, a Free Spin Bonus Feature game, a Gamble Feature game, a maximum coin jackpot of 10,000, and a maximum cash jackpot of $50,000! The quality of the graphics and sound that Microgaming provides is absolutely fantastic and top notch. They have an impeccable reputation of making the most stunning graphics and true-to-life sound effects that will truly transport you to “that specific theme” they used in any of their slot games. Most people love to play games incorporated with Microgaming software because they have smooth animation and engaging yet non-interfering sounds. In Adventure Palace, they bring players to the rich and lush rainforests of India, where majestic and exotic wild animals live and thrive. The symbols are drawn in a semi-cartoonish fashion, and even if they are vibrantly colored, you will play here for a long time because it will not hurt or strain your eyes. Simple animated programming is used on the symbols when you successfully hit winning combinations. The overall graphic design of Adventure Palace displays the vibrant colors of nature, especially the color green. Other colors used are brown, blue, purple, red, pink, yellow, orange, black and white. The constant background sound effects you will hear in this game are the chirping of birds and other animal sounds. When you get winning combinations with the animal symbols used in this game, you will hear the familiar sounds they make. For instance, you will hear the sound of an elephant trumpeting when you manage to form a winning combination with the Indian Elephant (wild symbol). The card deck symbols available in the Adventure Palace online video slot game are 9, 10, J, Q, K, and Ace, and they are entwined with vines that match the game’s theme. The regular symbols that you will find in Adventure Palace are animals native to India such as the Golden Langur (one of the world’s rarest monkeys), the Indian Peacock (India’s national bird), the Indian Cobra, a pair of Sarus Cranes (tallest birds in India, stands at 156 cm), and the Bengal Tiger (an endangered species; the national animal of both India and Bangladesh). The Wild Symbol is the Indian Elephant. It is a wild multiplier symbol. Thus, the Indian Elephant wild symbol not only acts as a substitute for all other symbols (except for the Scatter symbol) in order to you help you form winning combinations, but it also can multiply the payout! The Indian Elephant wild symbol doubles (multiplier x2) the payout of any winning combination it completes, as long as it acts as a substitute symbol. You are paid varying prize amounts (refer to the Payout table) when you manage to form a winning combination with multiple Indian Elephant wild symbols on an enabled pay line. Take note that the Indian Elephant wild symbol winning combination payouts are not doubled. The Scatter Symbol is the Temple. The scatter symbol is not required to appear in a line (on an enabled pay line) for you to win. The Temple scatter symbol can be found scattered anywhere on the 5 reels, and you are able to form winning combinations as long as there are 2 or more Temple scatter symbols that appear. Your winnings are calculated by multiplying the Temple scatter symbol combination payout (refer to the Payout table) by the total number of coins you’ve bet. If you manage to get 3 or more Temple scatter symbols, you will trigger the Adventure Palace Free Spin Bonus Feature game. Please take note that if you get a scatter win and a regular win, then you are paid out for both of these wins, because the Temple scatter symbol is not required to come out on an enabled pay line for you to win. Scatter awards are independent from pay line awards, and thus they are added to the pay line win. Please take note that if you get any winning combination, you can choose to gamble it in the Gamble Feature game, or you can just continue playing the regular Adventure Palace online video slot machine game. If you click the Collect button to collect your winnings, the Gamble Feature game will end, and you will be returned back to the regular Adventure Palace online video slot game. Please take note that you can gamble your winnings until the gamble limit is obtained; during the Gamble Feature game, all winnings are collected automatically; and the gamble limit is set at 5 gambles per game, or up until the gamble amount limit of 2,500 credits is obtained. Adventure Palace Free Spin Bonus Feature Game – If you manage to get 3 or more Temple scatter symbols anywhere on the 5 reels, you will activate the Adventure Palace Free Spin Bonus Feature game. You will begin playing the Adventure Palace Free Spin Bonus Feature game with 15 Free Spins, and all your winning combination payouts in these Free Spins are tripled! While playing the Adventure Palace Free Spin Bonus Feature game, you can re-trigger the Free Spins by just getting 3 or more Temple scatter symbols (anywhere on the reels), which will award you another set of 15 Free Spins! The additional Free Spins are included to your remaining number of Free Spins. There is an infinite amount of Free Spins that one can win during the Adventure Palace Free Spin Bonus Feature game. Once the Adventure Palace Free Spin Bonus Feature game is over, you will be then taken back to the main Adventure Palace online slot game, and your winnings from the Free Spin games will be included to your overall balance. Adventure Palace has 5 reels where you may bet on 9 pay lines. The minimum bet is 0.01 and the maximum bet is 2.00 per pay line. You can wager 1 up to 5 coins per pay line bet. Therefore, the maximum bet amount is 90.00 per spin. Please take note that the amounts mentioned are in Pounds, but they will remain the same if you choose to play in US dollars, Euros, or Canadian dollars. Also, for every coin that you wager, you will enable another pay line. You will be paid out for winning combinations on enabled pay lines only. The maximum payout in the standard Adventure Palace online video slot game is 10,000 coins per line bet. People who regularly play online casino games naturally love to stay longer on online slot games that have an Autoplay function. Good thing that Adventure Palace is furnished with this function! In Microgaming online slot games, they have 2 game modes – Regular mode and Expert mode. You can have the game spin automatically for you with the Autoplay function that can be found by clicking the Expert button (located at the lower left portion of the game screen). After customizing the Autoplay function to your preferences, just click on the Start button, and the game will automatically spin for you while you just sit back, relax, and enjoy playing this wondrous, nature-inspired, adventure-filled online video slot game! « More slotmachines guides Article last updated: Friday, January 17, 2014.